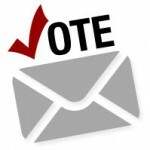 Vote-By-Mail Instructions A voter may vote by mail by completing the Application for Vote by Mail Ballot (listed below) and returning the application to the County Clerk’s Office. To receive your ballot by mail, the application must be received by the County Clerk 7 days prior to the election. A voter may also apply in person to the County Clerk until 3:00 p.m., the day before the election. The County Clerk cannot accept faxed or emailed copies of a Application for Vote by Mail Ballot, unless you are a Military or Overseas Voter, since an original signature is required. Notice: Due to recent changes in the law, no persons are permitted to serve as either a messenger or “bearer” of more than three (3) ballots from qualified voters in an election.